The easiest way to make rugs is using a printed canvas, but many of the modern designs don't appeal to me. I'm not a fan of "picture" rugs or cartoon-style patterns, though I'll finish these for other people. If I find one of those patterns in a charity store I use the contents for my own pattern and mix the usually acrylic yarn with wool to get a better pile. 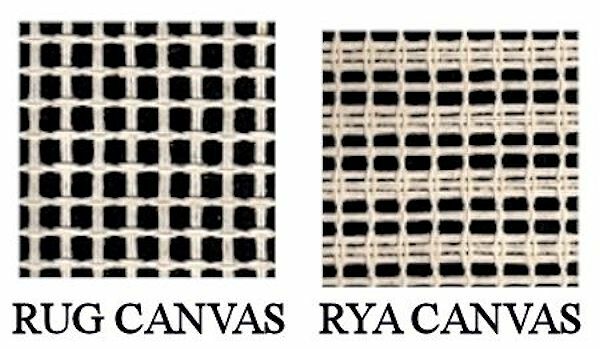 Printed canvases come with or without yarn and you can often find unfinished rugs for sale, in which case you may need to match the colours or rework sections of it to overcome discontinued shades. The second most common method uses rug charts. 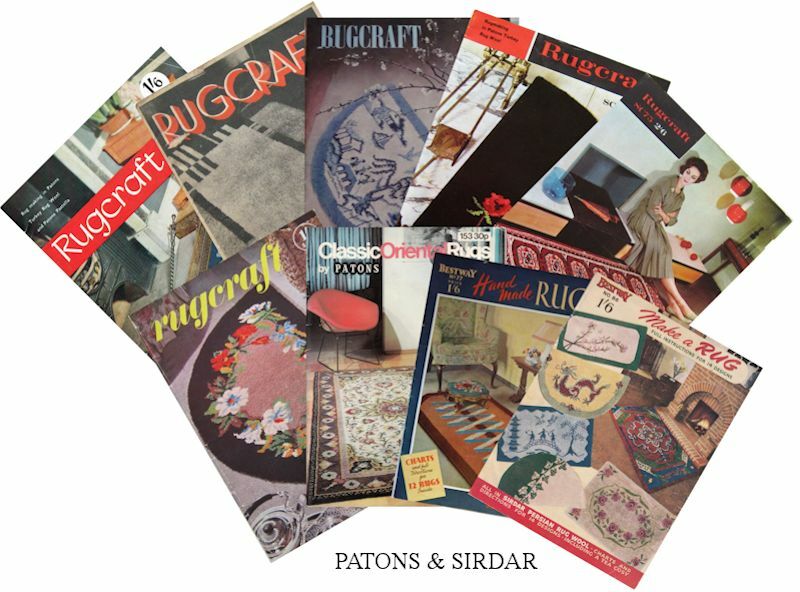 Patons used to issue a magazine containing rug charts (Rugcraft) and these days you can buy and download rug charts from websites. Old rug charts may be in black and white (using symbols for colours) or colour. Most of the original shades will have been discontinued, but Iriss and Anchor produce a wide range of shades that give good results, or you could pick your own colours e.g. work a rug in blues instead of browns. You may also have to work out the quantities required, or convert from weights to numbers of pre-cut packs. Though packs have a metric weight on them, it won't exactly match the wool-weight (possibly in ounces) used when the chart was printed. Iriss produce balls or rug wool by weight. 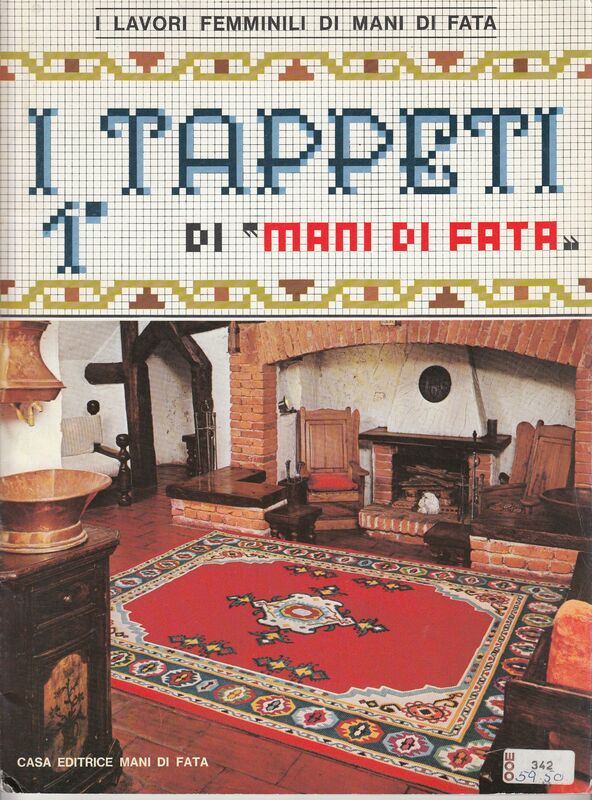 A nice Italian booklet of patterns that can be worked in cross-stitch, tapestry-stitch (half-cross or tent stitch) or rug-knotted. Cross-stitch patterns can be adapted for rugs, bearing in mind that the deeper pile of a rug will make the pattern less crisp. Cross-stitch charts may need to be simplified to use fewer colours or omit some of the fine detail that won't show to good effect on a rug. These can also be downloaded, often for free, or bought in books and magazines. 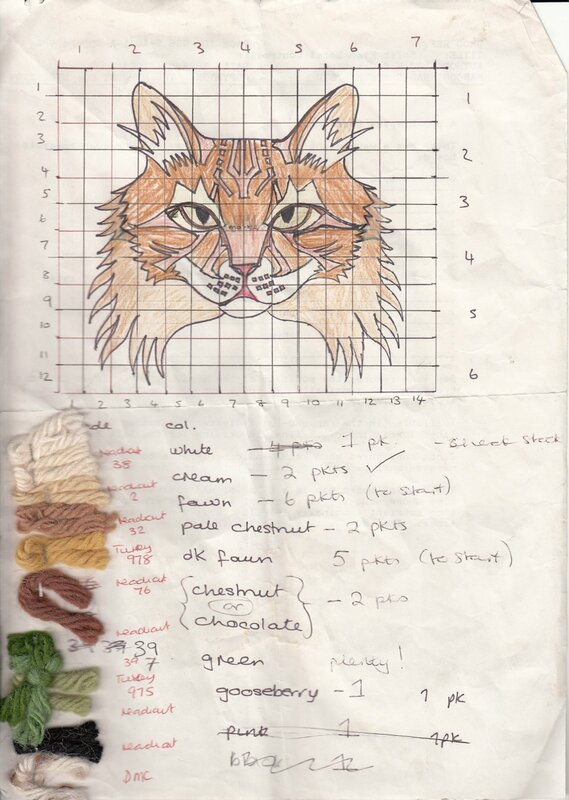 There is also software available to generate a counted cross-stitch pattern from a drawing or photo, but you'll probably need to simplify the number of colours used. 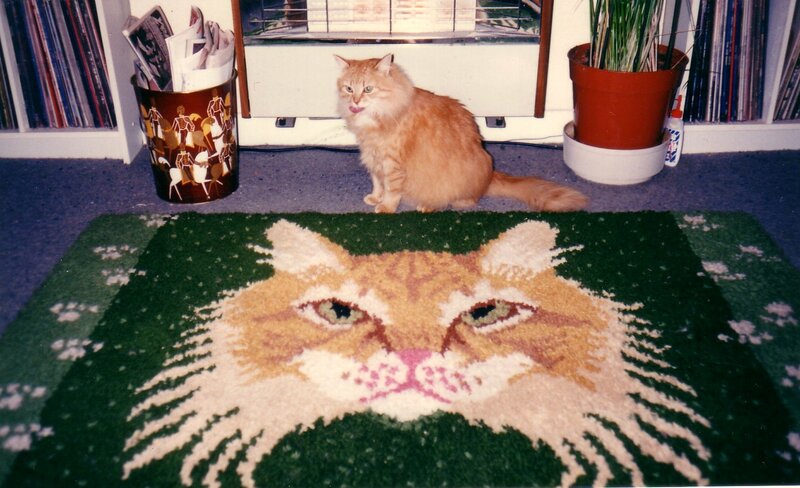 My "Lynx" rug and "Affy" rug were made in a similar way, but by hand. Most cross-stitch patterns will work with 4.5 hpi and 5 hpi canvases. When converting a cross-stitch pattern, consider the size of canvas it will need! Count how many stitches wide and high and assume 3.3 stitches per inch (3.3 hpi canvas) to give you the height and width of canvas required (you’ll then have to convert to metric – it’s best to round up to a whole number than round down). Then add an extra 10 holes at each cut end for turning over so the canvas doesn’t fray. The size of the worked area can be daunting. Personally I'm happy to spend several years working on-and-off on a 2 metre x 2 metre rug for my front room, but it's easy to run out of steam (and money) if you misjudged the size. I use cross-stitch patterns for my floral rugs as a design intended for the corner of a napkin makes a nice sized rug motif. A pattern 100 stitches wide worked on 3.3 hpi canvas will turn out 100 / 3.3 = 30.3 inches wide. Add another 10 holes (3.3 inches) to each cut edge for turning over. You'll need a canvas 30.3 + 3.3 + 3.3 = 36.9 inches wide. 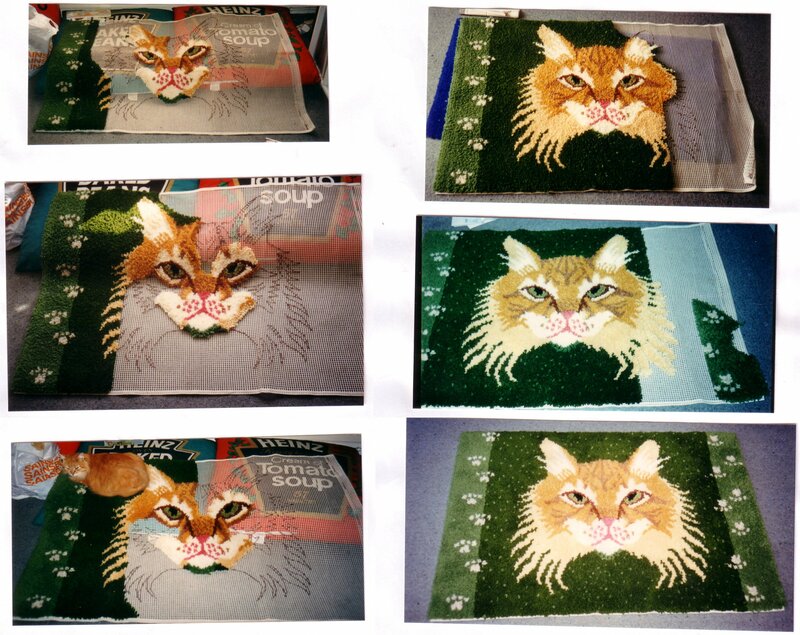 For my Lynx rug and Affy cat rug, I drew a simplified design from a photograph. I overlaid a grid pattern on this design; each square of the grid equalled 10 holes on the canvas. This matched the guide-threads on the canvas. I then used knitting wool to “draw” the design on the rug. Original pattern drawn on paper with a colour guide, noting the wool brands I was buying! I had to break the rule of working row-by-row when working this rug, so I could fine-tune the design as a I went. Scandinavian Ryagarn Rugs use longer, thinner, pieces than Readicut-style rugs. The instructions say to use three strands at once, sometimes three of the same colour, sometimes a 2-to-1 mix of colours. The result is a shaggy rug where colours blend into each other. The charts can be used with conventional rug wool, but without the shag-pile effect the simple designs can be rather boring. Cable Wool charts were designed for a thick grade of wool and using alternate holes in the canvas. This gave a chunky rug like the "coral" or “finger” rugs today. If you use a cable wool chart for conventional rug wools, you will use every hole, instead of alternate holes, so the design may be disappointing unless you use a bit of creativity and convert the chart for use with ordinary rug wool (such as filling in the unused holes). Vintage stencilled canvases are often advertised online; it’s not hard to transcribe the pattern from a clear photograph onto graph paper/ into Excel. The reverse side of a completed rug is easy to transcribed onto a chart. Dolls’ house miniature rug patterns are a good source of inspiration, particularly those worked in half-cross stitch. Because the rugs are scaled down, the colour scheme is usually simple and many charts designed for 12 hpi canvas can be worked on rug canvases. Filet crochet patterns – some of the designs work well as latch-hook designs. Red-work / black-work – some of the monochrome designs work well as latch-hook designs. Motifs from knitted sweaters can be transcribed onto graph paper. Many patterns for stitched rugs can also be used for hooked rugs.